There's been a number of articles lately about the drought gripping the southeastern United States. Several have addressed the impact that the drought, and accompanying water policy decisions, will have on endangered mussels in the rivers of the Florida Panhandle. 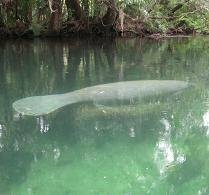 Today, the Orlando Sentinel, reported here on the ongoing water dispute. The story notes that Fish and Wildlife Service experts have predicted recent reductions in waterflow will kill bout 2 percent of the endangered fat threeridge mussels along the Apalachicola River. Mussels already have been hit hard by low waters for much of this year. Florida biologists have found that the shellfish, with a life span of decades, live in shallow water and cannot move quickly when the river levels drop abruptly. Federal officials are "pushing the mussels into extinction," said Dan Tonsmeire of the environmental group Apalachicola Riverkeeper. Earlier this month, CNN ran a story here on the impact of the drought on the forgotten coast. In addition to the damage to endangered freshwater mussels in the panhandle's rivers, the oysters of the gulf have been adversely impacted as well. The lack of freshwater flowing into the gulf has increased the salinity of the water and killed off oysters and other marine life. Seafood workers say oysters now are dying in Apalachicola Bay because of low fresh water flow since June. “Reducing water flows by millions of gallons every single day will be tantamount to a death sentence to the Apalachicola River and Apalachicola Bay if these flow levels are maintained,” U.S. Rep. Allen Boyd, D-Monticello, said in a statement. Apalachicola Riverkeeper asked Crist to file a lawsuit to block the flow reduction until Georgia conserves more water or restricts growth. A DEP spokeswoman said the state will examine documents before deciding whether to take legal action. “We feel like there is sufficient hands-on, eyes-on evidence down here now to show the flows prior to any reduction have been devastating to the fish and wildlife of our estuary,” said David McLain, senior policy advisor to Apalachicola Riverkeeper. For more information, see the Appalachicola Riverkeeper's website here. The picture above is of a purple bankclimber mussel from the USFWS's website.